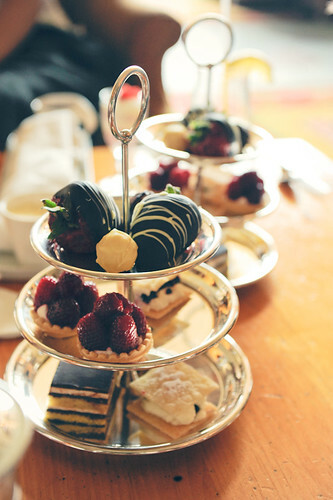 Afternoon Tea, a photo by iHeartDimSum on Flickr. I hope you all had a lovely weekend. Mine has been full of birthday celebrations. Two of my daughter's friends had birthday parties yesterday which actually wore me out more than her. Today was a more grown affair as I went for a girly afternoon tea to celebrate a friend's 40th. Here is a lovely photograph of afternoon tea. It's not my afternoon tea though sadly. I would have loved to have sat snapping away at the pretty cakes and sandwiches but I think I may have got some funny looks. All I managed was a sneaky Instagram picture!